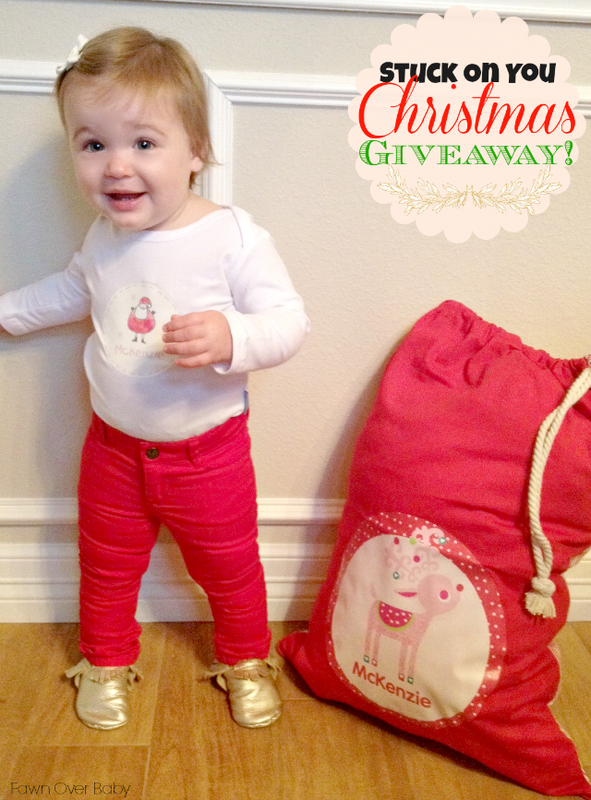 Fawn Over Baby: Stuck On You Christmas Product Review and Giveaway! 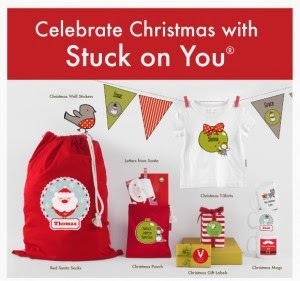 Stuck On You Christmas Product Review and Giveaway! Happy Friday Everyone! I know we haven't made it through Thanksgiving yet and here I am talking about Christmas, however, it's never too early to start preparing! Today I am so excited to share with you a few Christmas items from Stuck On You: Kids Labels & Gifts. Since my previous Stuck On You review and giveaway, I have become a HUGE fan of this wonderful company! To my excitement, they have come out with a festive Christmas line to get us geared up for the big day! This week, we received a few fun goodies to review and share with you, however, there are lots more to choose from at Stuck On You.com. Today, McKenzie is wearing a Stuck On You white long sleeve personalized onesie. This Stuck On You brand onesie is made with cotton elastane, making for extreme softness and added stretch for comfort. I'm so happy with the quality and make of this onesie and the personalized design makes it all the more special. Standing tall next to her is the ADORABLE Personalized Santa Sack made of 100% cotton canvas. This is a perfect way to wrap that big gift that is not "wrapping paper" friendly or a fun way to present several gifts as if Santa dropped off a sack full of gifts especially for your little one. With a solid front and striped back, this Santa Sack comes in red and black and can be personalized with 11 designs to choose from. We also received these sweet little kid designer name labels. This is a fun way to keep up with McKenzie's belongings while out and about or when she visits our church nursery on Sundays. 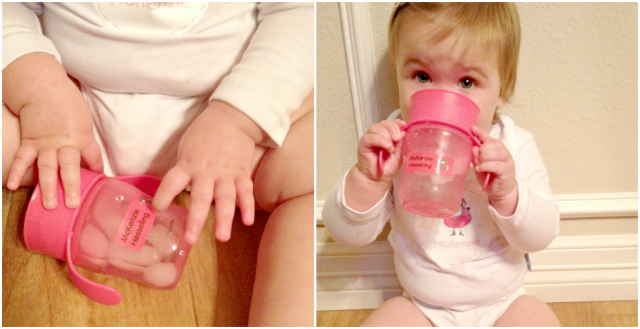 I put these on her sippy cups, her wipes case and snack containers. They are microwave and dishwasher safe and are covered with laminate so that your little's name will always be clear to read. Now that I am very familiar with the Stuck On You brand and the wonderful quality of their products, I am definitely going to turn to them when I want to add that special personalized touch to McKenzie's everyday accoutrements! Stuck On You would like to help you get into the Christmas Spirit by Giving Away a $25 Gift Voucher to TWO(2) lucky readers!! Winners Will Be Randomly Selected & Announced Tuesday, Novemeber 5th! Good Luck To You All & Thank You So Much For Entering! McKenzie is just darling :) Love the personalized Christmas bags! Thank you Steffany!! The Santa Bags are so lovely!! I might just have to order another as we grow our family! 1st Birthday Party Design by All The Frills!